First of all, if any mod sees this as belonging to another thread of mine, I humbly apologize, and, in that case, won't mind one bit if this gets merged. But since polls are difficult, another, unrelated study that was NOT a poll, published by the National Academy of Science (PNAS) found a similar value of the consensus. But the OP mentions a citation which rolls out the Oregon Petition. I must point out that this petition had little oversite over who signed it (resulting in signatories such as some fo the Spice Girls and PErry Mason, as well as other joke entries which later had to be removed), but it was also undertaken with the help of Fred Seitz who was at one time a head of the NAS but was no longer when he sent out the petition originally. In fact he made it look so much like a National Academies of Sciences project THAT THE NAS HAD TO MAKE A PUBLIC DISAVOWAL OF THE PETITION! Talk about "questionable behavior"! The OSIM isn't worth the virtual paper it is printed on. If there are legitimate scientists on there, hooray! They should take it up in legitimate outlets. If the peanut gallery wishes to hope that there is no consensus on this I highly recommend visiting a university or research facility in which professional climatologists work every day. Ask them. I live down the road from a major one and I used to work at another one. In my years in the earth sciences I never met many "agw skeptics". But I did run into quite a few people who thought it was real. I ask the other potential posters on this thread to ask yourself: what would a consensus look like to you? Would it have to be 100% perfect alignment? That isn't going to happen. Would 97% be enough? If 97% of doctors told you you had an illness that needed treatment quickly, would you say that your options were still 50-50 that you didn't have that illness? On your first poll, you read the numbers wrong. The number is only 89% of climatologists. It's still a great majority, but 11% dissent on the theory is not a consensus. Of the 10,500 people who were invited to take the online poll, only 30% participated. This creates a huge participation bias, which could have been in the favor of popular opinion, amplifying the result. As far as NAoS is concerned, they go by the same criteria. 97% of the top 50 climate scientists, but what is a top scientist to them? Number of publications published. This is, again, a plea to popular opinion more than a consensus since right now, those for AGW are going to be published a lot more than climatologists against. Also, there is the problem with only a sample size of 900. 97% percent of professionals who work in this area (which is a bit broader than just climatologists). Note: that's why I don't necessarily rely on the "poll". It is limited in scope. But then do you rely on the VOLUNTARY and poorly "policed" poll of OSIM? If you read the entire article you can see the detailed analytical techniques. Incorrect. It is an analysis of publications by professionals in a given field. You can fight it all you like. Dice and slice the numbers, but two independent methods find similar results. And indeed, you would be hardpressed to find legitimate climate professionals who fall outside of this boundary. But by all means, if "Dr. Jerri Hallowell" and "Perry Mason" are the kinds of folks you listen to for climate science then by all means, the Oregon Petition is a good source. more than a consensus since right now, those for AGW are going to be published a lot more than climatologists against. Ahhh, the "conspiracy theory" again. I see we can't get very far from it. The Creationists like that one too. So can I ask how YOU would go about doing this? Because remember: the OSIM is a VOLUNTARY POLL. It will fail the statistical sampling tests necessary to provide reliable reference material. The PNAS article is superior in that it is an analysis of publications and expertise. Again, I can understand how inconvenient it is for skeptics to see that indeed one is hard pressed to find skeptical scientists who study earth's climate for a living. There are a notable few. But I must stress the "few" aspect. Doesn't say anything about working says about who commonly post articles. You can post an article a year and still be working. I'm simply saying that, regardless of the constant smearing of OSIM, there are a lot of scientists who disagree. If you look at scientists who have posted 100 or fewer articles, it's actually 75/25 for/against. Only when you get to 500+ do you get 97%. Also, despite what the PDF says less than 1000 scientists were used in this. It's not an analysis of publications. It goes by number of publications, followed by the black-and white "convinced" or "unconvinced" criteria according to their graphs. There is no area for undertainty, probably, doubtfully, or any specifics as most scientists do have. Two independent results that show a very strong majority of probably more like 80%, but no consensus. I wouldn't call it a conspiracy theory. It's just reality that those that agree with the IPCC's summary are going to get the government grants. It's a bias in science. There i likely more dissent than appears pulically. Not a conspiracy. People are driven by money, even scientists. This is fact. All of these polls are voluntary. The participation bias depends on the invited sample versus the actual sample. I invite 1000 people to a party, and 30 show up and stay the whole time. Then, at the end of the party, I give people a simple survey asking if they consider themselves friends of mine. If 29 people answer "yes" des that mean that 97% of the entire population are friends of mine? No. It means you took a particular sample of people willing to participate and give their results. That's why you can't use polls for a consensus. I heard once from a scientist, forgot who it was, but it was on a proponent global warming program, but he said "A consensus is formed when people stop arguing." That is what should be relied upon. It is pretty hard because they don't receive government grants. The plan is to prove that man-caused global warming is real. Other areas of climate research don't get near that kind of funding. Keep in mind tat nearly all research money is granted by governments, not universities. The OSIM poll is a badly policed, and somewhat dodgy poll to begin with! Frederick Seitz's involvement was critical in getting it out there and the fact that because of this it appeared to look like something related to the NATIONAL ACADEMY OF SCIENCES, cause the NAS to PUBLICALLY DISAVOW IT. That 's quite telling. If I were to put out a paper that looked like it was from my former employer saying something my former employer didn't sanction explicitly, do you think I would be behaving "on the up and up"? And again, the fact that it was so horribly policed that they just wanted numbers of signatories (so Perry Mason and Jerri Hallowell from the Spice Girls were on the thing!) means it was deserving of oprobrium! which would be, technically speaking, an analysis of publications. No, two independent analyses show a strong majority of probably more like 97%. Even your by your reading of these articles, at 80% that's still an alarmingly high value. I guess for you a "consensus" has to be whatever number is 1 higher than the published number. No, it's the exact same conspiracy theory that creationists rely on. Sorry to break it to you. Sometimes science gets rejected by peer review for a REASON, not just because the reviewer doesn't like the cut of their jib. I've been peer reviewed and I've done peer review. It isn't as skewed and broken as the skeptics want you to believe. Wait until you've been around that block a couple of times. All of these polls are voluntary. Again, that's why I like the PNAS article because it ISN'T a poll. Ummm, I'm kinda familiar with sample bias. I do statistics in my job. So if you don't allow polls for consensus because of sample bias then you must eliminate the use of OSIM and the PEtition Project as evidence against a consensus since it is similarly flawed. It is pretty hard because they don't receive government grants. Conspiracy theory. Oh, yeah, you forgot to mention Richard Lindzen. He's still employed by MIT. How does that fit in the "Conspiracy Theory"? The plan is to prove that man-caused global warming is real. Other areas of climate research don't get near that kind of funding. LOL! Yeah, you're right there. Considering most universities go for government grants (and my wife lives with the hassles of non-stop NSF applications for the group she works for at a university). Thanks for the heads up on that. The people on that list did have to put down the degrees they had, and which fields they were in. I didn't really look into the OSIM deal that much, but, it does show that tons of people disagree, and, despite the smears, most people on there ARE scientists. It has less to do with numbers than it does admitted inconsistencies on the part of NASA, NOAA, and the IPCC. The peer review process isn't the issue causing the bias. Politics and money are the bias. Most fields of science don't receive near the money as climatologists studying AGW. The future funding of climate study depends on there being a problem with climate change. I believe this has a small effect on data collection, but the bigger problem is that a conclusion is reached far before science is done. Again, that's the problem, not enough science to make an absolute determination. Before you continue putting words onto the screen for me, as generous as you are, please better read the context I am posting as I've had to correct you multiple times on this. As I said, if you wonder if i am insinuating something, just ask first. But, on the general subject, I'm simply saying that all people have to make a living, and how much you make often depends on how critical of a role you play. Climatologists are considered an extremely important part of research, and that's deserving. It becomes a problem when you throw the moolah in with liberal politics and desired government results. Those things only prove that there is no shown consensus because you have two independent data sets telling two different stories. The government doesn't own MIT. 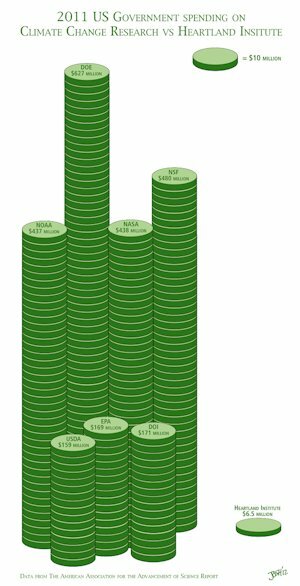 This graph shows the sheer amount of money the US government has into the climate change, and where it goes. Not to say that there aren't problems with the heartland institute, but this just shows the comparison between one funder of research and another funder. Because of the virtual monopoly of the US government in spending on Climate Change, it's clear how many places the bias can turn up in. Universities don't spend close to the money that the US government does. Shows even more of a lack of consensus according to his view on analyzing the emails. I'm thinking that an AGW education group should hold its own version of "Project Steve." Some other name, fred S singer I think, great GW books. Anderson actually lies in his blog. My opponent used it in a global warming debate against me, and she actually conceded that he was misquoting things. He claims that a report from the UN says something that it never said, for example. It's one of many signs of dissent though. To say "he lied" is one thing. To say that there's nothing to any of those multiple points of analysis could be a stretch. It also shows yet another educated person who disagrees with the AGW hypothesis. Now, before I begin, I will first completely agree that it's silly to fret over ground temperature records. I think there are some questionable alterations done. But, even given the raw data and given only a modest change in slope for even a couple of dozen stations, it doesn't take into account that land coverage is pretty good. I do think satellite data will provide us with better data and will solve the tampering date once and for all, but I just don't think it's a good idea to focus on ground results as a whole. There's not enough disparity, even given the court cases involving them. But, in saying that, you really did heavily cherrypick his article to fit your mold of conspiracy among weather station. Your entire argument zeroes in on those records. Now, before I begin, I will first completely agree that it's silly to fret over ground temperature records. I think there are some questionable alterations done. I'd love to know what "questionable alterations" you think are there, and I'd be glad to give you some of the background science articles on this topic, but since you don't want to discuss it, and I've likely heard every one of the points you will raise and could easily point you to solid refuations of them using real live science, it would be a pointless exercise. Since Dr. Anderson deigns not to cite what specific "admissions" he's referring to from the latest round of climategate e-mails I'll have to leave it to "true believers" to give him a pass on that one. so we're down to the classic creationist game of finding one single area of disagreement at a time? Interestingly enough, even if the Kilimanjaro findings are on, what about all the other tropical glaciers which are in retreat? Realizing that tropical glaciers are usually quite old and have seen a LOT of climate change yet still were there, but are going into retreat NOW is kind of sobering. But if you find ONE that has a debate about it's causus retreat, then by all means I bet all of modern science is WRONG about just EVERYTHING! I'm simply fascinated that skeptics can't marshall their own science but spend so much time obsessing over leaked stolen e-mails of interpersonal communications. That's an indication that the skeptics are too busy trying to find things to doubt. But maybe if someone keeps stealing interpersonal communcations from the climate research groups one day they'll find something. So far from Climategate 1.0 the found BUPKIS in terms of data fraud (repeated investigation found NO evidence of data fraud, and the worst found was one group dragging its feet on FOIA compliance). So the skeptic community should completely forget about doing science and just try to fund more THIEVES to hack computer systems and dig up interpersonal communcations. Funny when it happened to the Heartland Institute recently the Heartland threatened really scary legal attacks on the guy who leaked the stuff. Pretty funny that the skeptics don't like it when it is done to THEIR side. But by all means, keep supporting the theft and distribution of private conversations! And just be thankful that there's almost no scientists on the opposing side that way no one will have any good stuff to steal from them! It should be climatologists polled, they are perhaps 10-15% of geoscientists. In any case, the questions do not distinguish skeptics from CO2 crisis advocates. The earth has been warming slowly since the end of the Little Ice Age in the early 1800's. That's not controversial. The "nos" are likely interpreting the question as code for something else. The answer to whether CO2 is "significant" depends upon what is meant by "significant." A scientist is likely to say that if 20% of the warming is from CO2 that's "significant." Even 1% might be "significant" -- meaning detectable. 1. Is climate sufficiently predictable based upon present knowledge to make confident long term forecasts? 2. Is there a pending climate crisis that demands immediate government action to stop CO2 increase? The leap from "significant" to "demands government control of civilization to avert crisis" is a huge one. That's where the consensus evaporates. the reason the right questions are never asked is because crisis advocates know they wouldn't get the answer they want. The IPCC reports are never even put to a vote by the contributors. It might conflict wit the agenda. It should be climatologists polled, they are perhaps 10-15% of geoscientists. This would be incorrect. Speaking as one who has studied geology I can assure you that paleoclimate takes in more than simply climatology. As part of our discipline one is often required to know the environmental setting (in fact that is often crucial to proper interpretation of the data). So to limit it to only "climatologists" is to miss the "earth history" input. Let's take for instance the proxies. Many of these paleothermometry systems were developed from different aspects of geology and biology, so understanding the proxies, understanding the distribution and understanding the overall system is crucial. That is why the EOS paper by Doran et al. actully did a reasonable job of parsing out the subgroups. In any case, the questions do not distinguish skeptics from CO2 crisis advocates. Nor are they intended to. This "CO2 crisis advocates" and "alarmist" meme that the current AGW skepticism is rounding into is an attempt to "politicize" the debate. The polls and the STUDY by PNAS on the AGW consensus is not intended to do anything but give a better understanding of how "real" agw appears to professionals in the associated fields. The earth has been warming slowly since the end of the Little Ice Age in the early 1800's. That's not controversial. The "nos" are likely interpreting the question as code for something else. I like your "selectivity". You want firm science, but you latch onto the LIA as if it were a "done deal" in terms of "firmness of the science". It is still possible that the LIA was due to solar cycle and volcanic activity at the time, but that is still under debate. So in the effort to downplay the "settled nature" of AGW you rely on more unsettled science and treat it as if it is itself so well undestood that it couldn't be a "different" mechanism, eh? The LIA may have been linked to a solar minimum and we have been coming out of that but solar activity hasn't really increased since the mid 20th century. But never fear scientists have been studying this topic and Meehl, 2004 (I'm sure you'll work overtime to find out who he's connected to so you can reinstall the "conpsiracy") has found that solar irradiance has accounted for 15-20% of the earth's warming over the last century but can't explain the latter half of the 20th century's accelerating warming. (http://www.cgd.ucar.edu...) <- sorry it's not an amazon.com ad, I know you prefer to do you science through ads. Well, gotta go do some work here in Paris so I will return later on. As I said before, I'm not arguing about whether or not the things are true in those emails. What I am saying is that these are opinions shared by scientists. There are many more than what is listed here. We should be looking for alternatives. We're not Nazi supporters who just go with one opinion. It's not the data fraud that's the issue. It is the private doubt in the scientific community which is also shown in the papers you presented. How do you know they are thieves? It is almost certainly an insider releasing these. It's very easy to catch hackers like this who leave their information on the Internet. I used to be a hacker, so I have some experience with this. If it presents relevant information, I don't mind. This information should be free to the public anyhow. People have done their fair share of smearing of the other side as it is. People from the other side get peanuts compared to AGW nuts who get loads of government funding. There are really no alternatives to taking responsibility for our actions. The fact of agw leaves us with few "options" of alternative approaches. We will have to limit our use of fossil fuels. That's pretty much the be-all and end-all of the alternatives. No, for the skeptic community that holds onto CLimategate it IS this conspiracy of fraud and data manipulation. That's kind of why they rely on the CLimategate stuff. I have never once said there was perfect 100% consensus, but the amount of "questions" really isn't as big as the skeptic community wants you to think it is based on their reading of stolen, out of context, interpersonal communications. That's what it all boils down to. Since there is no indication either way and these appear to be leaked I'm curious why anyone would take that data and try to draw conclusions on it? I don't doubt the e-mails are real, but by similar points I don't particularly think it is anyone's business what is said in private interpersonal communications. ESPECIALLY when they have no bearing on the science as has been shown by numerous investigations after the fact. Not really. Imagine if I got onto your company's e-mail system and pullled out a huge chunk of just interpersonal stuff you said without any sort of context. Do you think I could easily spin a story that you were doing something "wrong"? Even when you weren't? I bet I could. People talk loosely when talking personally. People have done their fair share of smearing of the other side as it is. NOTHING like Climategate. Climategate has been a huge mess. Even the Cucinnelli in Virginia thought he could make hay with this and a good dose of the public cash. I'm sorry but it wasn't until about 2 years after Climategate e-mails were stolen...errrr..."leaked" that finally someone had the cojones to hit up Heartland. There's no comparison. Climategate turned into a "free for all" with everyone who could read at a 3rd grade level thinking they'd found something "deep and meaningful" in the nefarious words of the Climate Cabal. The internet has been red with accusations (almost NONE of which have proven to hold any water, and nary an apology in sight) since. People from the other side get peanuts compared to AGW nuts who get loads of government funding. This is more conspiracy garbage. Just look at Richard Lindzen. If he's not the best example that skeptics can exist within the system, then just look at John Christy at UAH. The fact that there isn't a lot of skeptic research may, just may have something to do with the quality of said research. Or maybe they aren't crawling out of the woodwork applying for grant money. I'd be glad to see the figures on how many climate science (skeptical) research proposals are turned down and why. But I am doubtful that we'll ever get that information from a "skeptic source" because that would be "detail" and a conspiracy theory is so much more comforting. This is where your mind s been played, my good friend. This is exactly how politicians want you to think It's a good way to think, but, people are using this against you to make you want to act. You have a good attitude, but it's in vain and just fueling this whole political and financial game that only a few are going to win at (and, you might win at after a few years of no electricity bills). This isn't what I am holding onto. I think that attacking data collection is the wrong. Wat Climategate and Climategate 2.0 DO show, and people always ignore, is that there is a serious lack of confidence in the data, models, and predictions for the future. The mass media primarily focuses on the degrading remarks made against scientists and says "this is the skeptic's issue." It's not mine. I don't think we have to throw dirt in this debate, and I think every learned skeptic knows that. Let the AGW nuts throw the dirt, because I'm not going to. I disagree. I think the emails show the exact same questions I've been posing to you, such as the unexplained cooling that is a "travesty" to the models. If what we are being told is lies, the ends do justify the means IMO. But, any hacker stupid enough to post this on the Internet would have been caught by now. This is omeone who probably already had priority access and likely saved the emails to another computer where he could post them to a web server. These are the opinions of the people spewing these shaky peer reviewed papers, then come out to the media (where they aren't peer reviewed) and speak with such bold confidene. These emails alert us that the lack of confidence shown in the actual papers is genuine and not just there to cover themselves up. If I were talking about something that affected your life, such as those things that affect policymaking, or corporate changes, then you have the right to know about those things. I am not more important than you or the world, and I think people need to understand that about scientists, even though it is unfortunate that more personal details get out than should, such as about personal lives. But, even considering that, it is a good thing that the truth of the uncertainty is more in the open now. You won't find much interesting about my life, trust me. I'm an awful boring person. I have no criminal record and no history of criminal activities. I'm as simple as simple gets in terms of lifestyle. Skeptics have been shoved aside for years. It's ridiculously hard for any to get funding anywhere. It's only very recently that skepticism on this issue stopped being laughed at and people like Lindzen can be a lil more public and open about it. Heartland doesn't even make a dent in the climate research funding. In the grand scheme of things, what they say doesn't even matter. There are a lot of things that do matter in those emails, but I will admit the full blown conspiracy theory is overblown, though some aspects of that still hold water, like those against Mann. It is very difficult for skeptics to be well published dueto publication bias. Those with seniority will likely survive long enough to be taken seriously, but those new to the field likely won't get a sniff from the skeptic point of view. I'll admit that you could be correct on this point, but based on the overwhelming amount of money given to proponents vs skeptics compared to the number of skeptics out there (20% of all climatologists if you dare go by that online poll taken on it), then I find it impossible to believe there isn't a funding bias. I'd like to see that from either side, honestly. Unfortunately, the only figures I see are just total funding allocated. I'm not against being wrong, but the discrepancy is too overwhelming for me to believe I am. I'm a realist, and I just don't buy the legitimacy of it. I recognize the problems with coal, but those come mainly from particulates. What about the numerous other nasty metals and materials that go up the stack? No, that is you jumping the gun because of my use of a single word. So when you say "if what we are being told is lies", you are using the word "lies" as something else? Because to lie to commit fraud on the listener. There are no "alternative" definitions of "lie" that make it merely a "difference of opinion". "lies" means when a scientist states something with "high confidence" that he is not highly confident about. That would be deception, hence fraud. You are parsing words here. I was not saying anything was fraudulant in the data. I'm saying that the scientists are not being honest bout the real level of confidence and quality of the observations. If say to my boss I am confident that this particular formulation will work and I am NOT confident then I am telling an untruth. To me, that is telling lies. And that is a form of fraud. Not saying anything about nature I'm just saying that the lack of confidence in the actual peer reviewed literature isn't that strong. Strange sentence construction. Are you questioning "peer review"? If you actually read the literature they often say things like that explicitly in the open literature. There is nothing really being hidden there. I don't use email except for when I sign up for something. I do not keep in contact with many people online anymore. I don't even know if I've sent an email to anyone in six years, honestly. Strange. No offense, but strange. So I will assume you are now taking the tack of simply "willfully missing the point". OK.
You're probably right, but they are important people to policymakers, and that makes them important in terms of how we will live our lives in the future. And so far no investigation of their behavior has found anything fraudulent in their treatment of the data. The fact that you and other non-scientists disagree with their results and wish only to look at the interpersonal, non-published back discussions because those are "jucier" I am doubtful that you would make good "policy" decisions. Do you think the NSF accepts only applications from "AGW proponents"? Do you think they have to "check a box off"? I'll have to ask my wife because she helps draft up and organize various NSF proposals at the research facility she works at. They've spend ten million, compared to the US government's two billion. That is 0.5% of all climate research. And Heartland and others like them are mostly playing in the arena of "public opinion" and not really science. That's because they realize like creationists, that the "skeptical position in regards to the science" simply doesn't have legs, but you can get the uneducated masses worked up just fine. That's why Creationists push their stuff onto children rather than trying to be real scientists. The NAoS gave him a spanking about using non-recommended methods. "The basic conclusion of Mann et al. (1998, 1999) was that the late 20th century warmth in the Northern Hemisphere was unprecedented during at least the last 1,000 years. This conclusion has subsequently been supported by an array of evidence that includes the additional large-scale surface temperature reconstructions and documentation of the spatial coherence of recent warming described above (Cook et al. 2004, Moberg et al. 2005, Rutherford et al. 2005, D'Arrigo et al. 2006, Osborn and Briffa 2006, Wahl and Ammann in press), and also the pronounced changes in a variety of local proxy indicators described in previous chapters (e.g., Thompson et al. in press). Based on the analyses presented in the original papers by Mann et al. and this newer supporting evidence, the committee finds it plausible that the Northern Hemisphere was warmer during the last few decades of the 20th century than during any comparable period over the preceding millennium. " Oh, I bet Mann's behind is stinging! The data is in the ratio of published works for vs against the AGW hypothesis. The burden of proof is on them to give us the numbers of papers accepted and rejected to show that this discrepancy is not due to bias, but rather is the genuine opinion. No the burden of proof for reviewers and editorial boards is not to convince you of anything. You aren't the audience. The audience is the rest of the scientific community. And guess what? About 97% of them disagree with many of your views. Maybe 97% of the world's climatologists just have a bias against you personally? Well, there is no empirical data that says the Earth was created 6000 years ago. You can't rule that out, but you can't do research on that. It's silly if you look at it scientifically. Ummm, actually you might wish to learn more about that. Have you ever heard of the "RATE GROUP"? (http://www.icr.org...) Yeah, so at least THEY think they are trying to do science. What I'm finding fascinating about your debate points, cbrhawk, is that they seem so "facile" and open to "special pleading". When shown direct comparisons between things suddenly well that's not the same as this. In a way it kind of is! No matter how much you and I will disagree with YEC "research" and dismiss it, they are just as serious about questioning standard geology as you are about questioning the agw hypothesis. Now, don't get me wrong, I don't think your skepticism of agw is nearly as inane as YEC skepticism of almost all of standard science, but when the reliance is constantly placed on some suggestion that good science is just kept out of the mainstream through nefarious means, well it sounds almost exactly like what these folks in the Creationist camp say. And at least in the creationist camp it is mostly just "finding errors" or "finding doubt". They call it a day and say that we don't need to believe the vast majority of scientists in this field because there's some indication of "doubt" there. You can't say the same about those against catastrophic global warming, where there are mountains of evidence against it. No, there are no "mountains" of evidence against it. There's some questions yes, some debatable points. Some uncertainty. Not as much as the "skeptic" community imagines. Just as there isn't as much "uncertainty" on standard geology as YEC's want. It's largely a matter of "degree". I don't actually think agw skeptics are as blindly anti-science and uneducated in the topics as YEC's are in geology, but the general approach is quite similar. Find doubt; leverage doubt.